Cubism was one of the most influential art movements (1907-1914) of the twentieth century, Cubism was begun by Pablo Picasso (Spanish, 1882-1973) and Georges Braque (French, 1882-1963) in 1907. They were greatly inspired by African sculpture, by painters Paul C�zanne (French, 1839-1906) and Georges Seurat (French, 1859-1891), and by the Fauves. In Cubism the subject matter is broken up, analyzed, and reassembled in an abstracted form. Picasso and Braque initiated the movement when they followed the advice of Paul C�zanne, who in 1904 said artists should treat nature "in terms of the cylinder, the sphere and the cone." There were three phases in the development of Cubism: Facet Cubism, Analytic Cubism, and Synthetic Cubism. After fauvist beginnings, Braque went with Raoul Dufy in 1908 on a trip to l'Estaque, a place often painted by C�zanne. They produced a series of landscapes with simplified forms and a limited variety of colors. The controversy surrounding their exhibition at the Daniel-Henry Kahnweiler Gallery brought Cubism its name. In effect, the art critic Louis Vauxcelles described the works in this way: "M. Braque scorns form and reduces everything, sites, figures and houses, to geometric schemas and cubes." The break with homogeneous form was completed the following year. Braque and Picasso's similar compositions are broken into planes with open edges, sliding into each other while denying all depth. Color is reduced to a gray-tan cameo, applied uniformly in small brushstrokes creating vibrations of light. The interpenetration of the forms lends these paintings a previously unknown aspect of continuity and density. Withdrawing before the abstract and hermetic character of this new space, Braque and Picasso brought recognizable illusionistic features back into their paintings during their stay in C�ret, from 1911 to 1913. They used letters, fragments of words, musical notes, then significant material elements: sand or sawdust which create relief, and tend to make the picture more physically an object. Color returned in force in 1912, in parallel to the creation of the "papiers coll�s" � collages. Creating a simple geometric armature and pieces of glued paper with trompe l'oeil patterns imitating wood, marble or newsprint, then introducing "already made" elements (musical scores, tobacco packets or playing cards), the "papiers coll�s" definitively dissociate color and form. Picasso, then Henri Laurens would create construction pieces from ordinary materials, cut out and assembled into colored geometric planes, where empty and full spaces combine to sketch out the forms. 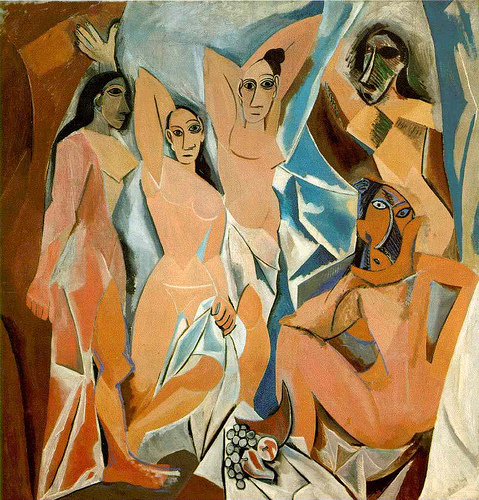 Although the war of 1914-19 ended Picasso and Braque's collaboration, the cubist core group remained active until the 1920s, through the explorations of Braque, Matisse, Laurens, Lipchitz and Fernand L�ger, whose geometric world and abstractly organized canvases with their contrasting, dynamic forms owe almost everything to the pioneering breakthroughs of C�zanne, Braque and Picasso.